Mergers and acquisitions, though likely a good move for business, always create big headaches when it comes to combining infrastructure. If your Java programming takes place in one office with your mainframe programming in another, and your infrastructure is maintained by a third-party, you’ve got quite a lot of complexity going on. 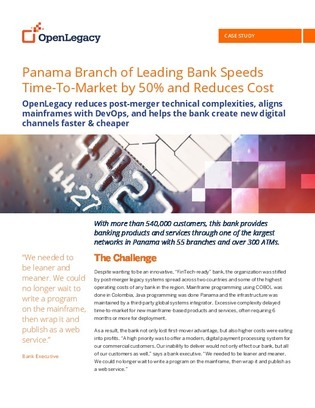 Such was the case for one leading bank in this case study, who needed a way to combine legacy systems and accelerate time to market by decreasing overall complexity. Jump in now to learn about the API integration and management software they chose to help them automate API creation from complex legacy systems.